Genesis does what Nintendont! Vectorman is hellishly hard, but it’s fun to turn from balls into a bomb and to explooodddeeee! On today’s show, Steve, Todd and Huell are joined by their (non-British) friend Pip to talk about how impossible this game is, unless you’re using the Game Genie. (Yes, even save states aren’t enough to overcome Vectorman!) There is also talk of Genesis vs. Super Nintendo, and Vectorman vs. Donkey Kong Country. And of course, balls and Ballz. Be sure to listen to the Snifferoo at the end, and if you’re interested in guesting on the show this week, send us an email at parentsbasementpodcast@gmail.com. You can also follow us on Twitter, or Facebook. Vectorman can be purchased on Steam for $2.99, or as part of larger Sega classics packages for $7.50 or $29.99. Hard copies on eBay are going for about $5 to $10, and unlike some other games we’ve covered, the inclusion of the box and manual only ups the price range to $15 to $25. 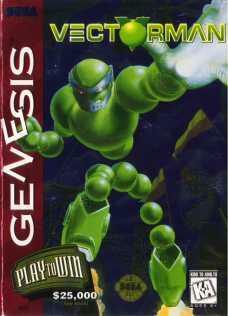 Vectorman 2 is in a similar price range. The Snifferoo from last week was the main theme from Vectorman, which can be listened to on YouTube here. The commercial that provides the opening music for this week’s ‘sode is here.